PINCH POINT® is the top choice for hunters looking for the ultimate deer feed-based attractant! Whether you pour it on the ground, mix it in a bait pile or use it in a feeder, PINCH POINT® will draw deer in from a distance with its aroma and hold them there with its flavor, nutrition and feed-based composition! The irresistible scent and flavor work to provide a killer combination that will create your own personal PINCH POINT® anywhere you choose! Create your own personal PINCH POINT®! PINCH POINT® is not the typical attractant available today. In addition to effectively drawing in deer, PINCH POINT® is a highly nutritious feed that will hold deer as well. 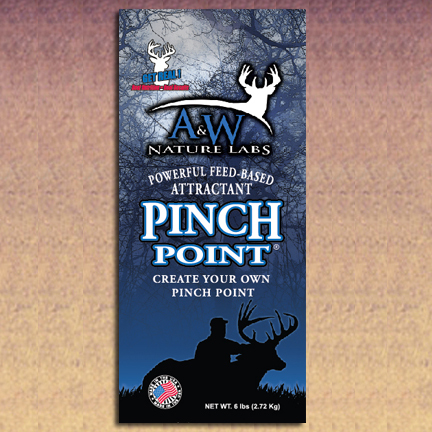 In addition to its aroma attraction, PINCH POINT® is nutritious and healthy for your deer. Its all natural ingredients include soybeans, corn, molasses, and whole oats. PINCH POINT® contains special yeast culture, live bacteria and enzymes designed to enhance feed intake, rumen function and nutrient digestion. PINCH POINT® is produced with premium ingredients that deer crave and mixed right here in the USA. Hunting pinch points is a very successful and effective way to hunt all type of game. Utilizing this method of hunting led us to wonder if we could create our own pinch points that funnel deer into our specific set up. After developing and testing numerous recipes, we have created a premium feed based attractant that will create the effect we were looking for! PINCH POINT® delivers! No matter your hunting terrain, PINCH POINT® brings deer into your hunting set up with it's scent and holds them there with it's flavor and nutrition. Create your personal PINCH POINT® spot in the middle of the woods, on the edge of a field or anywhere else you want to draw deer to!